He can be known as the Abraham Lincoln of undocumented immigrants. But thus far, President Obama’s record on immigration is depressing and dismal. The first black President has deported more brown people than any other President in U.S. history. For someone working on building a racial justice movement, one would imagine that a headline such as that would mean we are royally screwed. President Obama is nearing 2 million deportations, and estimated to reach 3 million by the end of his term. 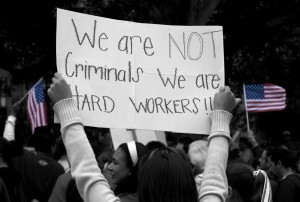 That is a quarter of all undocumented immigrants in the United States. Many such persons deported have significant ties to the U.S. and many are spouses and parents of U.S. citizens. Even while the federal government was shutdown, the Department of Homeland Security (DHS) was deemed essential, and continued to deport persons at a rate of 1,100 per day, tearing apart black and brown families and communities. As Congress emerges from the shadow of shutdown, the President has taken the opportunity to try and put immigration reform back on the agenda. While we desperately need some sort of immigration reform, many see this latest attempt as a way to divert attention from the record-breaking 2 million deportations under his Administration, and a way to pander to certain demographics for the mid-term elections rather than a genuine effort to undertake real reform before the next government shutdown on January 15. But here is the real problem. In its current frame, the pursuit for comprehensive immigration reform is a complete failure for both racial justice and real immigrant lives. It is reform without justice. One of the greatest victories of right-wing extremists such as the Tanton Network has been to push professional immigration reform advocates to adopt right-wing talking points. As such the entire immigration reform debate is framed along the binary of good immigrant and bad immigrants. Since 2005, immigration reform advocates have waged a national campaign for comprehensive immigration reform on the premise of exchanging a militarized border wall, privatized prisons and increased surveillance for a pathway to citizenship for a limited number of undocumented immigrants. Under the current frame, the 11.7 million who are undocumented and aspiring to be American have to “get right with the law,” “get in line,” speak English, pay fines, and pay taxes in order to gain some sort of legal status in the U.S. These are professional messaging points that bear no truth and no justice for immigrants. Instead, the good immigrant and bad immigrant frames has hurt advocacy for racial and immigrant justice. For example, when immigration reform advocates hold up banners saying “We are Not Criminals…” they inadvertently buy into the notion that certain demographic groups are criminals. When they emphasize a pathway to citizenship at the expense of basic human right to live, work and travel, they willfully ignore what citizenship means for a young, black man such as Trayvon Martin. When they criminalize and exclude various categories of immigrants from the blueprint for immigration reform, they make it harder to ally with movements for criminal justice and racial justice. This sign is problematic. We are all criminals. Besides, most of the immigration reform agenda ignores and feeds into the real problem — many white people are petrified of the rapid demographic changes occurring in this country, mostly due to immigration from Latin American countries, which have been devastated by neo-liberal globalization policies. They do not like that the country is becoming more brown. However, instead of constructively talking about race and the devastation caused by U.S. foreign policies that lead people to move here, professional immigration reform advocates have tried to pacify these white racist fears with the discourse of “aspiring Americans.” The message is that the 11.7 million will just assimilate into the “melting pot” of the United States and won’t threaten white supremacy and white privilege. Of course, it is beside the point that not a single undocumented person actually identifies as an aspiring American in real life. As Junot Diaz put it, we actually cannot be certain that people stop being immigrants. Perhaps many of the 11.7 million will integrate much like the previous amnesty, but not because the 11.7 million necessarily want to be American voters but because most of them just want to work, drive, travel, take care of their families and be left alone by Immigration and Customs Enforcement (ICE). Yet, despite this salient assimilationist rhetoric, comprehensive immigration reform is not going anywhere. And that is mostly because the campaign messaging is predicated on a series of lies that does not inspire faith or confidence among undocumented immigrants who cannot relate to it. The other strategy–placating to the extreme right-wing nuts at the GOP–does not help matters. Staunch defenders of President Obama’s terrible immigration record state that the GOP is the real problem and the reason why the President has had to take a tough stance against immigrants, ramping up enforcement numbers, in order to sell immigration reform to them on a bipartisan platter. However, if the recent government shutdown has shown us anything, it is that compromising with whiny hostage takers is a bad idea. In order to win on policy matters, well-meaning immigration reformers have to stop focusing on winning elections for the Democrats who bear just as much responsibility for draconian deportations and immigration detention system, and start focusing on playing both sides. But comprehensive immigration reform is just one vehicle for those of us who are more interested in immigrant justice and less interested in winning elections for the Democrats. Our fight for immigrant justice is not just about Latinos — it is about everyone who is racially profiled and treated as second-class in a country that is supposed to be the land of the free and home of the brave. In order to cut through the current impasse on immigrant justice, immigrant rights and criminal justice movements, as in brown and black people, need to recognize their shared experiences, common goals and build a racial justice movement. Everyone pays lip-service to black/brown solidarity but it has not translated into anything meaningful for the thousands of black and brown persons who are increasingly incarcerated in our jails, prisons and detention centers. Without actively working and building alliances in black communities, non-black immigrant rights advocates threaten to isolate themselves from those with whom they have the most in common. We have much in common with the black community and the movement for criminal justice. Sometimes, this solidarity is wrongly expressed by labeling immigrant rights as the “new civil rights movement.” This is yet another example of how mainstream immigration reformers have no racial justice compass. Instead of falling into the trap of calling ourselves the “new civil rights movement” and faking civil disobedience actions for history books, we need to build solidarity not on literal comparisons of our oppressions, but on our shared experiences with the system. As such, immigration justice seekers need to have a critical dialogue on race and stop compromising with racists. Before all else though, we need the President and his latest nominee for DHS Secretary, Jeh Johnson, to stop the deportations. Forget time is now. Time has passed. Amen, a million times over. Thank you for writing this. Has America’s first Afro-American President Barack Obama Laws made All Latinos in modern day America “target criminals” based on “ethnicity” alone. I am a Latina Nurse I been beaten down by “Obama ICE police” after work in my own community with my hospital uniform on.Just being ID “Latina” made me a “nurse” an Obama Crime. Has Obama made Latinos like me America’s “New Jews” like Nazi Germany? I am afraid to walk to church on Sundays and after to the local store. This is America?or Nazi Germany? GOD HELP US ALL. Something got to give! STOP THE HATE President Obama.STOP THE HATE on Me and all Latinos citizens of Humanity.I HATE NO ONE! PEACE and good will :-)GOD BLESS our America.